The Living Well Lab, which is facilitated by the Innovation Unit is a space where those involved with the Living Well Network, including staff from the Living Well Network Hub (the Hub) can explore what they are doing through the stories of people they have been working with. 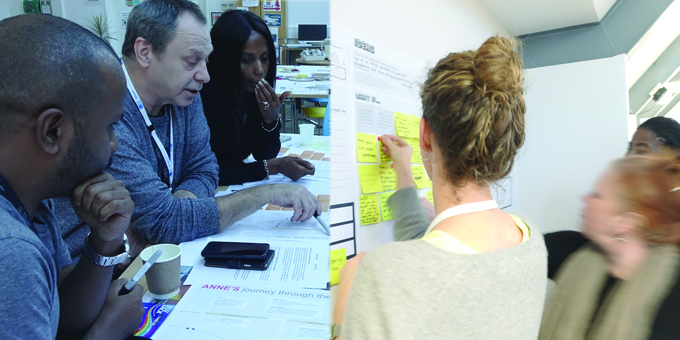 The design sessions offer an opportunity to pursue new ideas and to further develop the network. The 2nd Living Well Lab was held at Mosaic Clubhouse, in Brixton in December. Staff followed the stories of two people who had recently used the Hub, which is based in Streatham, to understand their experiences and to see if there were things the Hub could do differently. They explored the opportunities each story had presented and came up with ideas that they could test out. The next Lab will be open to anyone who would like to attend and will be held on Thursday, 25 February at 1.30pm. Please email: Emma.Willing@lwnhub.net if you are interested in attending.